Visit the LivingSocial page on TopCashBack page for info on this deal. The Living Social deal is for a Sams Club Membership for $45 with a $20 credit and some other freebies. Its for new Sams Club members only. The TopCashBack deal adds $20 cash back for new TopCashBack members. This deal ends Friday. So counting the $20 cashback and the $20 sams club gift card you are paying $5 net for Sams Club membership. I don't have Sams Club nearby so I'm not a member. Please you use my link above and I will get a referral bonus for TopCashBack. I've seen some talk lately about how housing costs are becoming a higher percentage of peoples spending. The point of the discussion was that this was a bad thing and getting worse. 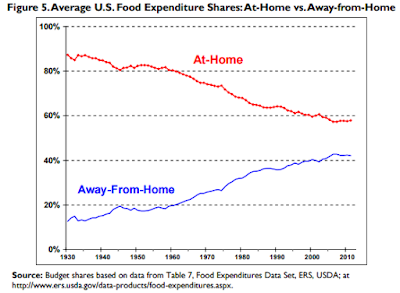 On the other hand though, food used to cost a lot more as a percent of our income and that trend has gotten better. 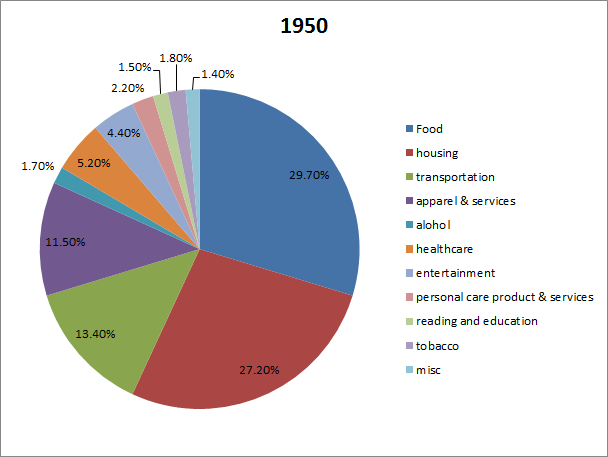 How does housing plus food spending today compare to 1950? I looked at spending in 1950 versus 2008 household spending levels back five years ago. So I'm kind of rehashing the topic here but I figured why not look at it again. The BLS has a report on 100 years of consumer spending with data for specific years including a direct link for 1950 I compared that to the 2013 data. I used this 2013 table which happens to break it down by age but I just looked at the overall average figures for all families. As you can see the amount spent on housing has gone up a lot but the amount spent on food is about half what it was. 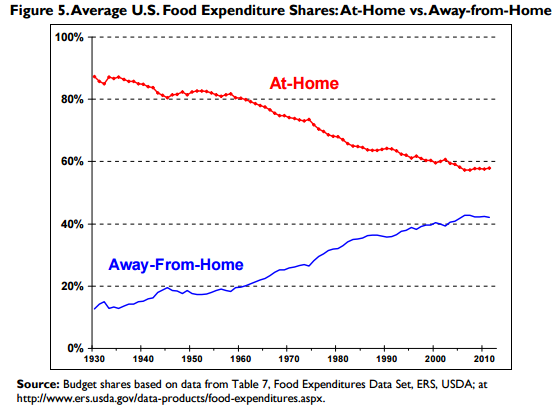 If you combine food and housing then we're spending a little bit less at 54% in 2013 versus the 56.9% in 2015. From that we can see that people spent around 25% of their food money at restaurants in 1950 versus around 40% nowadays. The basics of food, housing and clothing was 68.4% in 1950 and just 58% in 2013. In 1950 we spent 1.7% on alcohol and 1.8% on tobacco. Those numbers are down to 1% for booze and 0.8% for smokes as of 2013. On the other hand our spending on reading and education has doubled from 1.5% in 1950 to 3% in 2013. These are both positive trends, though the total impact on a family budget isn't huge. Now someone might concluded that people have to spend more on housing because it is more expensive. Or you might think we spend less on food because we don't have the money to do so. But you can dig into the details on food prices to see how its really cheaper today relative to the 1950s. So you can see there across the board the individual items are a much lower % of your income. I last did rental comps in May 2015. It seems rents haven't changed much at all for our properties in the past 3 months. Unless rentometer is broken or something. This time I just figured the year over year (YOY) difference between August 2014 and August 2015. I'm starting to trust the usefulness of the Rentometer data less and less. I did a quick search in Craigslist for 3 bedroom houses in the area for property E and I couldn't find anything at all comparable under $1400. Hard to believe the median is just $1225 like Rentometer says. I assume this is because Rentometer doesn't differentiate between houses and apartments. But even if I broaden the search to all 3 bedrooms including apartments, condos, etc then I still dont' see properties under $1200 level. The rent Zestimate from Zillow is over $1500 for the E house which seems a lot more in line with what I'm seeing in the active market on Craigslist. Is a $49 Monthly Lease for a Fiat 500e a Good Deal? I heard a radio ad from a local car dealership leasing Fiat 500e electric cars for $49 a month for 24 months. Sounded like an awesome deal but of course theres a minor catch revealed in the fast talking legally required disclosures at the end of the ad which is that it has $3400 due at signing. Still that seems like a decent total cost. You'd be paying $49 x 24 + $3400 for $4,576 total in two years. Thats $2,288 a year. Most new cars are going to depreciate that amount in a given year plus the 500e is electric so you'd save on fuel costs. The 500e gets 87 miles out of a full charge. The battery is 24 kWh. At 11¢ per kWh that equates to $2.64 for a full charge and about 3¢ per mile. A reasonably good MPG gas engine car might get 40 MPG. With gas costing $3 per gallon that comes out to 7.5¢ per mile. If I were to put 1000 miles a month on the car then I'd be paying $30 in electricity for the 500e versus $75 in gasoline for a gas car. In total I might save up to $45 a month in fuel costs driving the electric 500e versus a gas car. However thats the maximum savings assuming you hit the 1000 mile limit on the lease so your actual savings would be less or you risk paying extra on the lease for going over their 12,000 mile per year limit. The net cost including fuel savings would end up at $2,288 for the lease minus $540 a year or $1,748. I think thats a pretty good cost for driving a new car. If I was in the market for a new car and a small car like the Fiat 500e would work for me I might consider such a lease. However I might be better off buying a slightly used 2012 or 2011 Nissan Leaf for $10,000 to $12,000 range.